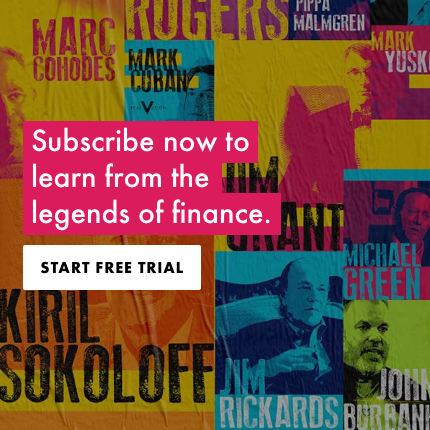 In this episode of The One Thing, we take a look at the life cycle of asset bubbles, and look back at some of the world's most famous blowups. Some really negative feedback on this. It was worth keeping but aimed at a newer audience. I recommend continuing it but label it 'Intro' content. Thumbs up anyhow. Sorry, this weakest video to date. Horrible style and didn't even scratch the surface on bubbles. Real Vision you are so much better than this. This is a joke, right? I pay to view serious content, not wanting to see some clown trying to be funny that belongs to a Youtube channel. If this is a Youtube video I would give it a thumb up; because the guy sure is funny at what he does even though what he says is completely misguided. Nope. Sorry. The guy is good at what he does, but this isn't Real Vision content. what a joke. C'mon RV you're better than this. This video belongs on a clickbait thread on Youtube and not on Real Vision. Please don't do this again RV. You are better than this (dude). It's for the millennials and the college students that Real Vision is partnered with. It's well done but I think I have ADHD now as a result of watching it. I'll probably have my kids watch it to gauge their reaction. Not sure if millennials is accepted as a word yet but didn't feel millennia was correct either. I thought the guy did a good job , very clear and well articulated . Knew he would upset the Bitcoin bulls buy c'est la vie . add: these videos are repulsive with the evidence of vomitting. I love real vision and have been a member for 2 years now, but videos like this I think insult the intelligence of the average viewer tbh. I love the deep dives into subjects given by experts. This is like a catchy video to grab youtube followers by a comm major millennial. I think they're trying to expand their viewership and when I was 20ish, much of the better content would have been too heady/wonkish. It's obviously not geared to the balding 52 yr old with a paunch. Sorry guys. I enjoy and appreciate most of your content but things like this are pure 'mission drift'. I've seen other pieces like this but they've been more frequent as of late and it's not a positive trend. Well done. Simple and to the point. Something for the novice. These shorts are great. I'm currently nearing the end of my free trial and I wouldn't pay for this type of video. Happily, the others are much more informative and don't sound like the "World top 10 biggest snakes" and similar videos that my son watches. Definitely you will miss out a lot Leon. I just signed up for one year membership! Agree. Less informative than "Top 7 Eagle Attacks"which I think the same guy narrates. Free trial'ers shouldn't be allowed to comment. Actually liked it. Finally something I can watch with kids. I like that you guys are trying something new but I’m having a hard time understanding how easy off topic family guy style jokes mixed with buzzfeed/ teen Disney editing will bring in your target crowd. If its working for you great, my two cents is that a 1st time viewer might seriously underestimate the quality of the RV content if this was their only impression. One could posit that bubble butts are not merely a fad but a secular trend.